The chairman of the school board in Prince George's County says he's not stepping down despite allegations of abuse and neglect in the county's Head Start program that led to the loss of a $6.5 million federal grant to run the program. "I've got support from the county executive; I do not intend to resign," said Segun Eubanks on the Kojo Nnamdi show on WAMU. 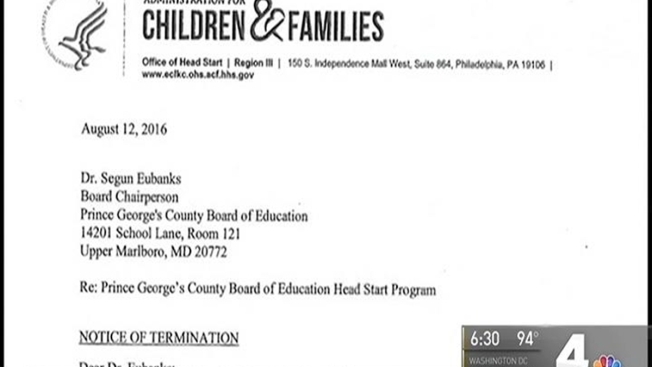 Five members of the school board have called for Eubanks and vice chair Carolyn Boston to step down, saying they withheld information about a federal investigation into the Head Start program. That investigation uncovered disturbing allegations: Of very young children mopping up their own urine while teachers took photos, of children who were able to leave the school and were found wandering near busy roads far from school, of students punished by holding heavy books over their heads for long periods. The investigation also alleged the school district failed to report problems in the program. Some parents at a community meeting Thursday night echoed the calls for resignations. Thursday night, the board voted that it would not contest the loss of its grant. "We are very troubled by it," Eubanks said in an interview. "And we did not want to put ourselves in the situation of having to defend those actions." U.S. Rep. Donna Edwards released a statement on the Head Start program Friday. "Incidents such as these do not exist in a vacuum," the statement read. "They are indicative of a systemic breakdown within the entire leadership chain that has placed children in danger." The program is still underway for the 2016-17 school year, led by a new grantee. A transition is underway -- but there are many questions, including whether teachers now employed by Head Start will keep their positions and their level of pay. A work group is working on those issues right now. And Eubanks said that the board will get to the bottom of Head Start's problems, after the program is stabilized for this year. "Once we get past that crisis, I'm willing to go into a full investigation of everything that happened," Eubanks said, "why it happened and where it happened, who made mistakes and when, and hold folks accountable for that, myself included."